In case LG Optimus Vu's teaser from a couple of days ago got you curious how a 4:3 aspect display might look like, we have some good news for you. A photo of the device has emerged, where you can see LG's upcoming phone/tablet pose next to its biggest competitor (or inspiration?) - the Samsung Galaxy Note. As you can see from the photo above, the screen of the newcomer is wider than the unit of the Galaxy Note, despite its smaller diagonal - all thanks to its 4:3 aspect ratio. A screenshot from the LG Optimus Vu from the same source hints at its software capabilities too. 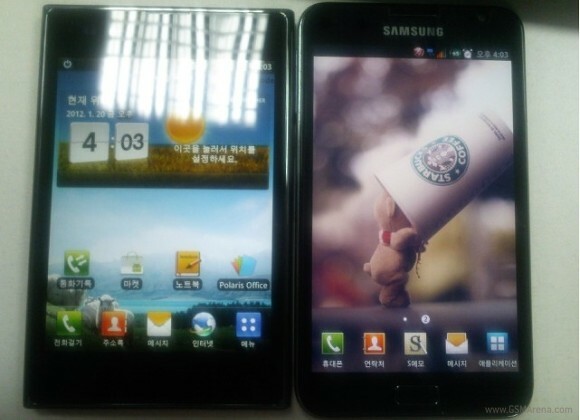 The phone will likely do some tricks, which will resemble the Samsung Galaxy Note's functionality. We haven't learned more about the specs, than we know already. They include a 1.5GHz, dual-core Qualcomm Snapdragon CPU, 1GB of RAM, 8 megapixel camera, 8GB internal memory, NFC, Android 2.3 Gingerbread, and the impressive 5" IPS display with 1024 x 768 pixels resolution. It shouldn't be a surprise if we see the LG Optimus Vu break cover during MWC at the end of this month. Naturally, we will update you accordingly the moment we find out. Why does everyone assume they should mostly watch movies with it? Yea it may not be very good for movies, but this format is best for websites.